As we sit down at the dinner table this week surrounded by friends, family, and plates of delicious food, we reflect on the many great things we’re thankful for this past year. 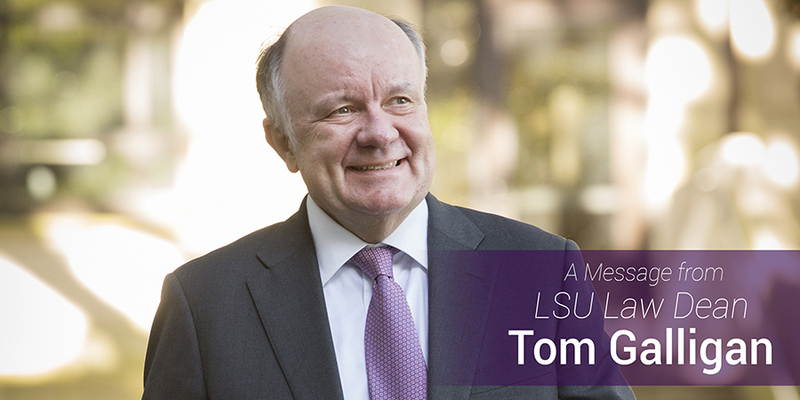 As dean of the LSU Law Center, I have numerous reasons to be thankful. LSU Law is home to the state’s greatest legal minds, and hundreds of students who, one day, will undoubtedly leave their mark on the legal community. Our Civil Rights team took home first place in the Peter James Johnson National Civil Rights Trial Competition on Oct. 22 at St. John’s University School of Law in New York City. 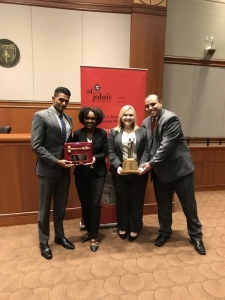 The team of Sohil Sharedalal, Brandi Barze, Meagan Johnson, and Ahmed Soussi defeated Suffolk Law School in the final round to claim the title, and bring home LSU Law’s third national championship in three years! This fall, we were joined by a new colleague, Raff Donelson. Raff holds a JD and a Ph.D. in Philosophy from Northwestern, is a joint appointment with the College of Humanities and Social Sciences and its Department of Philosophy and Religious Studies.This is an important time to be hiring because the pool is very strong and the national decline in law school applications and students means there have been fewer opportunities for great people to obtain employment as law professors.This is a time of real promise for those law schools able to hire. And we are currently searching for additional colleagues to join us next year. Four LSU Law students had the tremendous experience of arguing in front of the Louisiana Supreme Court on Oct. 16. Jessica Thomas, Lacey Sanchez, Jacob Irving, and Erin Abrams — members of the LSU Appellate Clinic — represented Reggie Thibodeaux, an indigent defendant from Terrebonne Parish, and argued for Thibodeaux’s right to file a motion to suppress all evidence pro se while represented by a public defender. On Sept. 29 and 30, LSU Law welcomed back six classes to its annual Reunion Days celebration. The Classes of 1977, 1987, 1992, 1997, 2007, and 2012 returned to Baton Rouge for a dinner on Sept. 29 and the all-alumni tailgate and Hats ’n Canes ceremony the following day. It’s always a pleasure to reunite with LSU Law graduates and hear of their success after graduation. Also that month, McGill University professor Rosalie Jukier delivered the John H. Tucker, jr., Lecture. As a member of the LSU Law Center community, you should be proud of the hard work and accomplishments of our students, faculty and alumni. And certainly not least, I’m thankful for you. If you’re reading this, you care about the LSU Law Center, its students, and its future. You are a driving force behind our success, and I thank you for that.